Artist Nicola Wheston is not afraid to talk trash, but her latest exhibit, Stuff: We Become Our Things, does the trash talking for her. Recording the stuff we have, what surrounds us, and the things we see in our everyday lives, Wheston’s new work shifts our focus onto the tidal wave of waste created in a consumerist society. Wheston’s life-size series of ten paintings, Stuff, is turning heads at the San Juan Islands Museum of Art (SJIMA). 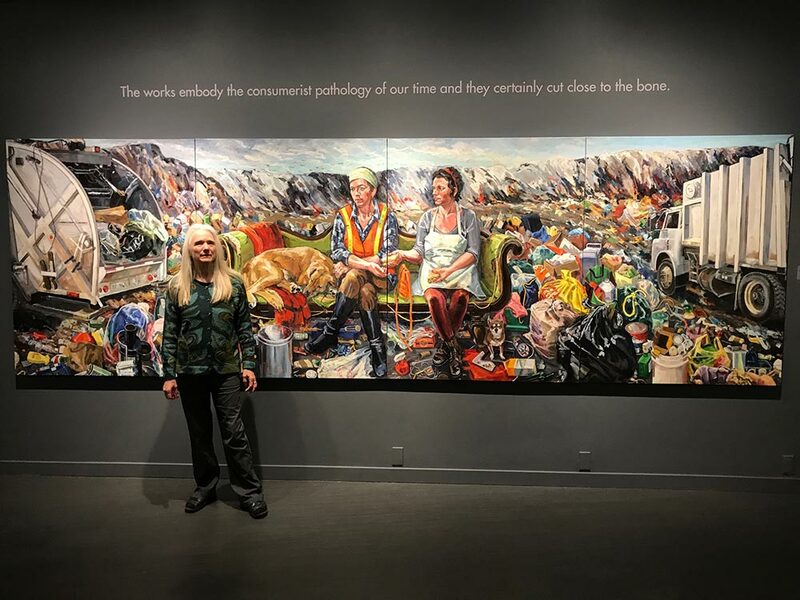 Her controversial subject matter is not one generally interpreted by a narrative painter, and she’s delighted by the notoriety and recognition it’s gaining. Wheston’s inspiration for her series began when she had the misfortune of clearing the estates of deceased relatives. One, a hoarder, proved especially daunting. These experiences galvanized Wheston’s awareness of the real impact of our consumer society and how unsustainable it is. Her new series, five years in the making, highlights this effect and helps transform our relationship to ourselves, as well as to our stuff. Based on Salt Spring Island, British Columbia, Canada’s top artist colony, Wheston is a past winner of the “People’s Choice Award” (SSNAP) 2015. Her work provokes and wakes us up to what we use and see in everyday life on a level that is disturbing and yet capturing. Wheston’s paintings are monumental in size, consisting of four panels, five feet by sixteen feet canvases. She is noted for her use of strong colors. She adds, “Living in Mexico influenced me to paint with more alive and vibrant colors.” This is her first exhibit at the SJIMA and her first exhibition in the US. Art goers are intrigued by Stuff and by Wheston’s use of depth, detail and color to create surreal canvasses that are life sized, as well as stirring.